I first saw Adam White read his poetry at North Beach Poetry Nights in the Crane Bar. 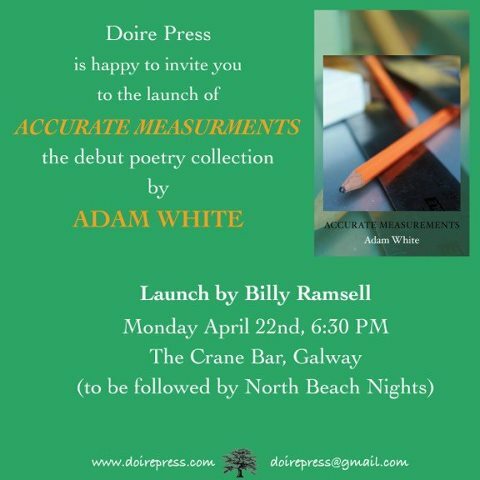 'Accurate Measurements is Adam White’s debut collection and is published by Doire Press. It confirms what those familiar with White’s work have known for some time - he is an absolute original. Though he rose up via the performance poetry route, he has never been given to roaring at microphones or removing items of clothing to enhance his metaphors. His work as a carpenter greatly influences his approach to poetry. Each of these poems has clearly been gone back to time and again. In ‘Graduand’, ‘Strike!’, ‘Estwing’ and ‘Chainsaw’ he writes with a rare absence of cynicism about his work, which he clearly loves and not merely because it sometimes puts bread on his plate. The carpenter’s skill and persistence rescues said wardrobe from the terminal ward and he imagines “Her Saturday readying herself in/its glass”. In today's Guardian, the Forward Prize shortlist for this year has been announced: The shortlist for the £5,000 best first collection prize includes Dan O'Brien's War Reporter, inspired by interviews he conducted with a Pulitzer prize-winning journalist. Also in the running are collections published by two tiny presses – Adam White's Accurate Measurements is published by Doire Press in Connemara, while Steve Ely's collection, Oswald's Book of Hours, is published by Smokestack Press in Middlesborough. They are pitted against three of the biggest publishers in UK poetry: Faber & Faber for Emily Berry's Dear Boy – a wittily disturbing soliloquy; Bloodaxe Books for Hannah Lowe's Chick; and Seren Books for She Inserts the Key, a collection that juxtaposes sparrowhawks and the Bank of England, crafted by former City solicitor Marianne Burton. The chair of judges, Jeanette Winterson, hailed a "powerful year for poetry". Huge and heartfelt congratulations to Adam and John and Lisa. If it wasn't so early, I'd have a glass of brandy.